Guest Packages are used when you want to offer guests an inclusive package of lodging, meals, amenities, etc. Guest packages can print one line (such as GOLF PACKAGE) to the folio or they can print each line item separately. The individual charges are broken down on the charge journal, final recap, AM Report, etc., even when only one line prints on the folio. Guest Packages may be selected by guests making reservations from your website if you use WebRes®. You may have up to 20 line items (charges) per package. When adding Room Charge (RC) and Room Tax (RT) codes to the package, you must be sure to NEVER MIX fixed and calculated rates. If you mix fixed and calculated codes then the posted amounts will be unpredictable. - With Fixed Room-Rate Packages you pre-set the dollar amount of room charges and room tax charges. "Package code" may be up four alphanumeric characters. If you have a lot of packages or seasonal packages it will be helpful if the characters each mean something such as KSDW for King, Summer, Dinner, Wine but you may code packages in any way you wish. "Package description" prints on the guest folio when you choose the one-line option. Examples: Honeymoon Getaway, Golf Package. "CODE" is a valid charge code such as RC, RT1, WINE, etc. "DESCRIPTION" defaults to the charge code's description such as ROOM CHARGE. This cannot be changed. "AMOUNT" is the dollar amount of this item. For Fixed Room-Rate Packages you must enter an amount. 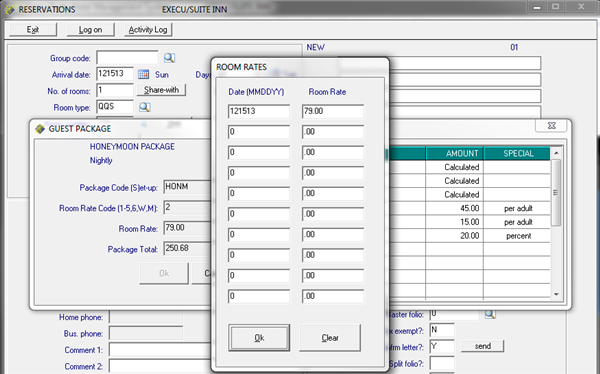 Variable Room-Rate Packages are set to calculate the room and room tax charges. To add a percentage fee such as resort fee you can enter a percentage in the amount column. Enter 20 for 20%. 7 must be in the "Special" column to use the percentage feature. Percentages apply to room charges only, not to incidentals. "SPECIAL" sets parameters for this item. 0 (zero) will post this charge to the room regardless of the number of occupants. 1 will post this charge per adult. 5 will post this charge per adult and child. 6 will post this charge per child. 7 will post this item as a percentage of total room and incidental charges with the percentage amount designated in "Amount". "Folio print option" designates how to print the package on the guest folio. Y prints each item separately each night. N prints one line per night. This line will be the package description. T prints one line (package description) per night but prints the tax separately. S prints one line per stay. "Package type" if blank posts the package nightly. N1 posts the package the first night only. I1 posts incidentals the first night only and posts room and tax charges nightly. "Minimum/maximum nights" is an optional setting for WebRes which sets minimum and maximum number of nights for this package. "Active? (Y/N)" should be set to N if you do not want this package available in look-up by staff. Y will display the package in look-up. "Available in Webres?" check this box to allow this package to display in the WebRes Package drop down box. "Rate code (1-5)" does not apply to fixed room-rate packages and can be left blank. "Package total" displays the total per night for this package. "Notes" can store additional information about this package. 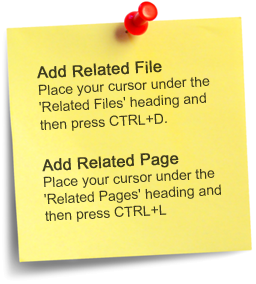 Click "Notes" or press Alt+N to open. "AMOUNT" is the dollar amount of this item. 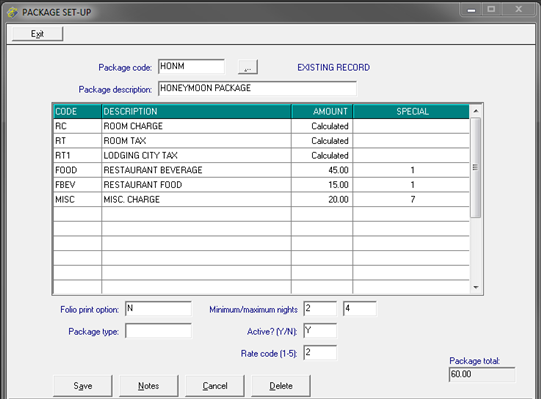 For RC* and RT* enter C in the amount column to allow the system to calculate the room and room tax charges based on rate code, season, number of persons, and room type . For Fixed Room-Rate Packages you must enter an amount. To add a percentage fee such as resort fee you can enter a percentage in the amount column. Enter 20 for 20%. 7 must be in the "Special" column to use the percentage feature. Percentages apply to room charges only, not to incidentals. "SPECIAL" sets parameters for this item. 0 (zero) will post this charge to the room regardless of the number of occupants. 1 will post this charge per adult. 5 will post this charge per adult and child. 6 will post this charge per child. 7 will post this item as a percentage of total room and tax in the percentage amount designated in "Amount". "Rate code (1-5)" sets the rate code to use when calculating the room rate (RC*). "Package total" displays the total per night for this package excluding RC* and RT*. RC* and RT* are not included in the package total since they are variable depending on room type, season, etc. The package total will display on the reservation or folio once this package has been selected. To select a package for a reservation, enter P in the "rate code" field. A new window will prompt you for a package code, which you can look up if you do not know the code. Variable rate packages allow you to set a rate code; however, the package may be set to a default rate code. A second window will open showing default rates (based on rate code, seasons and room type). If the rate changes during the guest stay due to date change, both rates will display, showing the beginning date of each rate. You may change these rates if your security level permits. 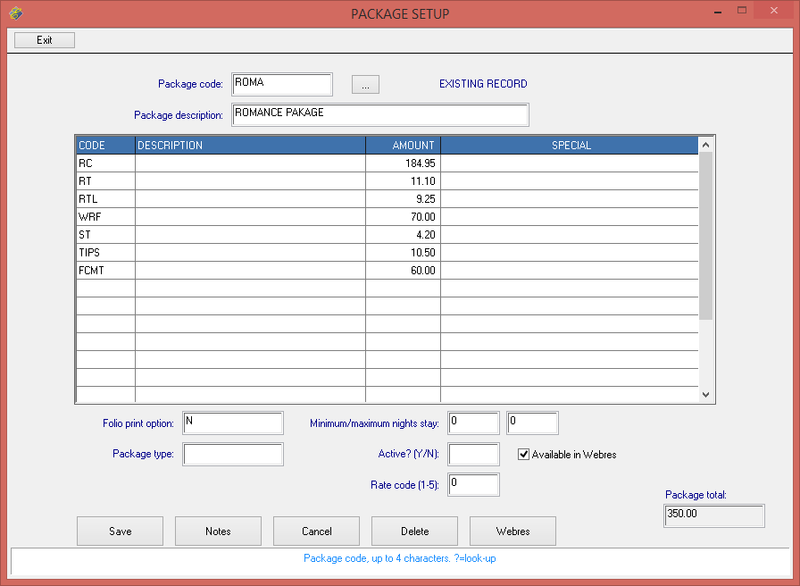 The package detail will display and the package total will display. The package information also will display at check-in and can be viewed when the folio is accessed.